US Federal Reserve is now included cryptocurrencies in the FRED database, this is their move to control the crypto market so it never competes with their currency. Manufacturing declines. Trump is now pushing tariffs on Europe and China, pushing the economy to the edge. Central banks are now pushing their agenda, they are now unwinding and raising rates at the same time into an economy that is fake. BoA doesn’t understand why people are running into tech stocks, last time this happened was the dot com bubble. IMF is now revising Europe’s global growth and they are blaming it on Italy and the BREXIT. Both sides are now battling it out. Strzok is now stripped of his security access. Comey and Lynch might be subpoenaed if Feinstein agrees. There is another pic floating around on Facebook showing a girl crying because she was separated from her mother, this turns out to be not true. Supreme court now says you cannot track people on their cell phones. Merkel and Macron are in trouble the rest of Europe is not going along with their plan. North and South Korea are reuniting families, North Korea began returning the remains of Americans. Syrian army launches offensive. Syrian army was attacked by moderate rebels, it is now being reported that FSA is now defecting to the Syrian Army. Assad says that he doesn’t think the US wants talks and they will never change from the past. This is the beginning stages of having peace talks and getting the troops out of Syria. This week the Federal Reserve Bank of St. Louis added cryptocurrency to their Federal Reserve Economic Data (FRED) database. It’s a seemingly small gesture, but one that signals to most observers crypto’s maturation, at least in the eyes of arguably the most important central banking institution in the world. Manufacturing plunged to its weakest since Nov 2017. More worrisome is that Stagflation is here – New Orders tumbled to the lowest since September and inflation spiking with input costs at their highest since Sept 2013. So surging prices are crushing orders and production is continuing to ignore it.. for now. That won’t end well. Currently, the US charges just 2.5% on car imports. This is lower than the EU’s 10% and China’s 25%, although the latter will lower its tariff to 15% from 1 July. Markets were surprised today when the Bank of England took a “hawkish” turn and announced that three out of nine members of its Monetary Policy Committee – including influential Chief Economist Andrew Haldane, who’d been considered dovish – voted to raise the Bank Rate to 0.75%, thus dissenting from the majority who kept it at 0.5%. The International Monetary Fund is likely to revise down its growth forecasts for the euro zone as the area faces higher risks from trade, Britain’s talks to leave the bloc and market jitters over fiscal easing in Italy and other states. When the fund publishes its new forecasts on the global economy in July, it is likely to slightly revise down its growth estimates for the 19-country euro zone but does not expect “a sharp slowdown,” the fund’s managing director Christine Lagarde told a news conference in Luxembourg on Thursday. BI special agent Peter Strzok has been stripped of his security clearance, days after he was physically escorted out of his FBI office, said Attorney General Jeff Sessions. US congressman Mark Meadows has suggested that the FBI may have meddled with evidence in the case against Trump’s former national security adviser Michael Flynn. he was referring to the 302 FBI reports that contained summaries with suspects and witnesses, Meadows said: “Were they changed to change the outcome of prosecution decisions. I think they might have”. — Paul Sperry (@paulsperry_) 19 июня 2018 г.
Senate Judiciary Chairman Chuck Grassley (R-IA) says he’ll issue subpoenas for former FBI Director James Comey and former Attorney General Loretta Lynch, but the panel’s top Democrat Dianne Feinstein (CA) has to agree to it per committee rules. Grassley also said he would be open to exploring immunity for Comey’s former #2, Andrew McCabe. Feinstein may be hesitant to sign on, as she says she thinks Comey acted in good faith – which means she thinks Congress shouldn’t have a crack at questioning a key figure in the largest political scandal in modern history. Comey skipped out on appearing before Grassley’s committee this week following the June 14 release of DOJ Inspector General Michael Horowitz’s (OIG) report on FBI conduct during the Hillary Clinton email investigation – which dinged Comey for being “insubordinate” and showing poor judgement. Horowitz is conducting a separate investigation into the FBI’s counterintelligence operation on the Trump campaign, including allegations of FISA surveillance abuse. Maybe Comey also decided to bail after Horowitz admitted on Monday that he’s under a separate investigation for mishandling classified information after leaking a memo to the press documenting what he felt was President Trump obstructing the FBI’s probe into former National Security Advisor Michael Flynn – which was conducted by the FBI under dubious circumstances, and for which evidence may have been tampered with. Loretta Lynch, on the other hand, was dinged in the IG report over an “ambiguous” incomplete recusal from the Clinton email “matter” despite a clandestine 30-minute “tarmac” meeting with Bill Clinton one week before the FBI exonerated Hillary Clinton. 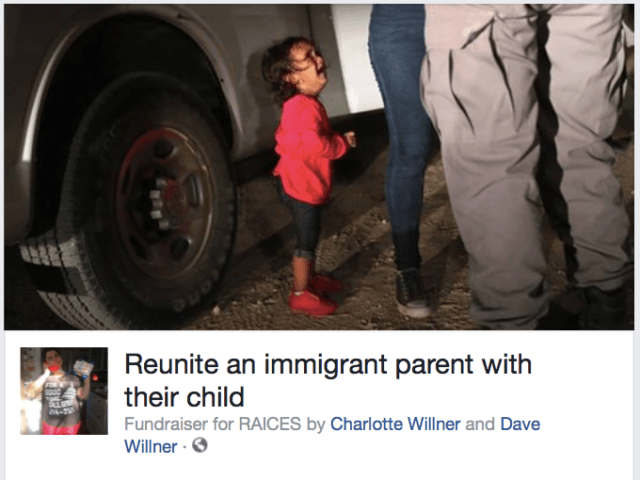 The fundraiser, “Reunite an immigrant parent with their child,” asks Facebook users to donate money to RAICES, a charity described by USA Today as “a Texas nonprofit that helps families with legal advice and translation services.” The organizers of the viral fundraiser are reportedly a couple working in the tech industry in Silicon Valley. In a 5-4 ruling, the court held that the acquisition of cell-site records by government officials is covered under the Fourth Amendment. While stressing that their decision doesn’t question longstanding surveillance techniques and tools such as security cameras, Roberts said that historical cell-site records present even greater privacy concerns than monitoring via GPS. Privacy groups say that cellphone location data is different, however, and could lead to a slippery slope of privacy violations involving email, text messages, social media posts and internet browsing histories of suspects. Europe’s two self-proclaimed leaders were facing an unexpected backlash from most other European governments against the German and French plans for a common eurozone budget, dealing a blow to the two countries’ ambitions for a big overhaul of the single currency area. As the FT reports, the rest of Europe’s “core”, including the Netherlands, Austria and Finland are among 12 governments questioning the need for any joint eurozone “fiscal capacity”, challenging a central tenet of French President Emmanuel Macron’s vision for the eurozone that he has successfully pressed Berlin to endorse. increasingly unpopular French president Macron and the politically embattled Merkel tried to restart their close collaboration this week ahead of a wider summit of EU leaders. They agreed that a new common pot of eurozone money could be funded by a mixture of national contributions and new EU levies, such as a financial transactions tax. the Dutch finance minister said in the letter, adding there was also no agreement to start exploring the use of a financial transactions tax to finance it. And the punchline: the letter was written by the Dutch finance minister on behalf of Belgium, Luxembourg, Austria, Sweden, Denmark, Finland, Latvia, Lithuania, Estonia, Ireland and Malta. The simple math: 2 vs 12, and it is safe to say that the rest of the eurozone is not aligned with France and Germany either. North and South Korean officials met Friday for talks on resuming reunions of families divided by the 1950-53 Korean War as the rivals boost reconciliation amid a diplomatic push to resolve the North Korean nuclear crisis. Seoul’s Unification Ministry said the meeting will discuss ways to carry out an agreement on the reunions made between North Korean leader Kim Jong Un and South Korean President Moon Jae-in during a summit in April. Trump announced that North Korea has returned the remains of around 200 US soldiers killed during the Korean War. This comes days after other US officials said such transfers would begin through UN Command in South Korea. The US has long sought the return of troops unaccounted-for after the Korean War armistice, with military data suggesting 7,700 were unaccounted for. North Korea has returned limited numbers of remains over the years, adding up to about 200 other US troops. The US has drawn a 55km “deconfliction zone” around the Al-Tanf base, threatening to attack any Syrian troops that enter it. The so-called “deconfliction zone” also encompasses the Rukban refugee camp, which is believed to house families of US-backed militants alongside other civilians. The incident came shortly after several alleged airstrikes on Syrian government troops and allied forces, which were attributed to the US-led coalition. the U.S. Coalition did not bomb their forces in southern Syria tonight. Free Syrian Army (FSA) has allegedly defected to the Syrian Arab Army’s (SAA) side, the Russian Reconciliation Centre reported this evening. According to a Russian military expert, Vladimir Kuzin, the US is training terrorists at 19 different military camps within Syria’s borders. Kuzin describes the supply of weapons, food, fuel, munitions and various other supplies going to these camps from other US military bases in other nearby countries. Syrian President Bashar al-Assad has commented on the possibility of talks with the United States at the present moment in his interview to NTV channel, saying that Washington’s policy was unlikely to change in the nearest future and thus, establishing a dialogue would be a waste of time. “We do not believe that US policy will change in the near future. It [negotiations with Washington] is a waste of time,” the Syrian president said in an interview with the Russian NTV channel. Assad explained that US presidents are hostages to lobbyists’ interests.